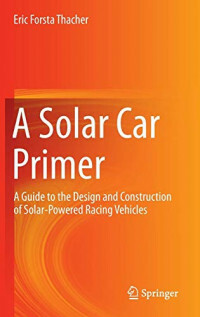 This exciting primer on Solar Racing literally starts from the ground up, describing how the interactions of a vehicle with its environment circumscribe its ultimate success, from aerodynamics to resistance and propulsion. By demonstrating how to mathematically model these underlying physical phenomena, the author helps solar racing competitors carefully select key characteristics of the vehicle, such as weight and shape, to produce optimal speed. Energy conversion and demand are given particular attention, followed by chapters devoted to examining solar racers’ design, manufacture and testing using a structured problem-solving process to keep projects on track and on schedule. A chapter devoted to energy management strategies provides invaluable tips on maximizing average speed during a race. Complex issues such as ventilation system analysis and performance simulation are covered in dedicated appendices. The financial aspect of project design is not neglected, as both fund-raising and cost estimation are given in-depth consideration.